Creating a startup is now so hip that some people are launching them without having a clear plan on how they will be making money out of it. Not that making money is everything, but making money is what will give you the freedom to pursue your dream. I’ve seen dozen of companies set up to have a fast start, a fast growth, to be a “startup”, but very few with a purpose to be prosperous in the time, kind of "last-long" companies. When you focus on starting fast, and seeing some metrics rise rapidly, you most probably are focusing on the wrong metrics. Such as “users growth”. Who cares about having thousand of users if those are not converting to clients? Ok, in some very rare cases it makes sense and the story ends nicely (Instagram / Tumblr); But for the rest, the only metric that really makes sense is the profit. Focusing on the wrong metrics is really risky. Indeed, your are growing fast, but you are hiding a more important face of your business, how will you last? With money from investors? It can work for few months, maybe years, but even the most amateurs will see the subterfuge and won’t follow in the next round. So, founders will decide to end the story. It doesn’t mean the product didn’t have a market, or execution wasn’t good enough, but that there was too much focus on the speed of the growth rather than on its steadiness. 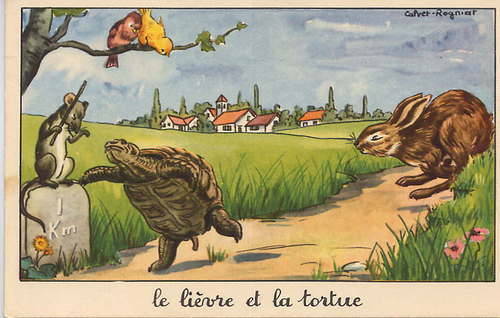 Thinking of the rabbit and turtle, no needs to go fast just go well. Then what does really matter? Turnover does, profit even more! But why not considering qualitative metrics, such as jobs created, apartments bought by your employees, babies born from your employees etc. Think of the happiness you can deliver by building a strong and aspiring to live-long company. Finally, you should think of your own time, are you having fun doing what you do? So what you want is to do it the longest as possible! Of course, exiting with a big check is exciting, but less than 0.01% of startups does, so stick to a long-term vision first. Buy you time! You might not be ready of a rapid growth but for a steady one. There might advisors, investors, councils, who will press you to execute, distribute, grow, hire/fire fast etc. Who are they? Do they carry your vision? Or are they looking for rapid ROI? Those might not think of your own interest, so try to think by yourself. Is your decision the best for you and your company? or is it best for them? You don’t need to oppose everything they say of course, but take time to analyse how your moves will impact the run of your startup. So let’s build more last-long !